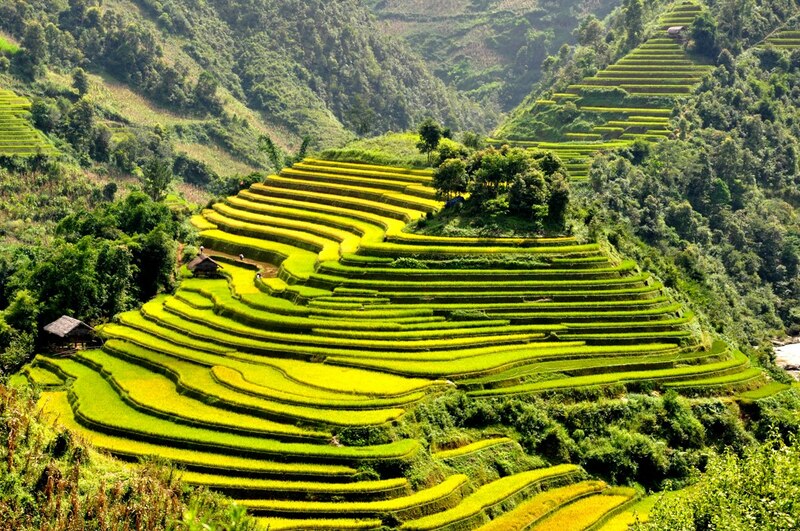 Enjoy the return Hanoi – Sapa ride with our luxurious and direct Topas Mountain Express limousine; take the best remote hiking tours along rice fields to experience the ethnic communities, relax with a quiet stay and breathtaking mountain views at Topas Ecolodge. Day 1: Comfortable drive to Topas Ecolodge and hike to neighboring Red Dao village. From 6:30 – 7:00 AM, you will commence from your hotel with Topas Mountain Express for a 5 hours transfer to Topas Ecolodge. The walk in the afternoon commences from Topas Ecolodge on a quiet road with a great view of the rice terrace below. You then take a slightly ascent to Lech village where you will visit a local house, meet the friendly Red Dao hosts and experience their daily way of life. The Red Dao women, as their ancestors, having hair and eyes brows shaved and wearing very colorful customs. They are famous for beautiful handmade embroidery. On the way back to Topas Ecolodge, you will walk on small trails passing rice terraces and cross a suspension bridge, where you can take some great pictures of the landscape. Your guide will explain about the interesting cultivating culture of the local farmers. Back at Topas Ecolodge, you may want to try a traditional Red Dao herbal bath at the lodge’s newly opened spa. Enjoy you breakfast in our restaurant or at the terrace. 9:00 AM you will commence the excursion with a transfer deeper into Hoang Lien National Park to the trek starting point near Sin Chai village. You are now “off the beaten track”, enjoying beautiful views of high mountains, waterfalls and the deep valleys. The trails will soon lead you to the Red Dao village of Nam Nhiu, here you will meet the villagers, enjoy a cup of green tea in their house and learn about their daily way of life. Leaving the village behind, you will turn into a small dirt trail and soon be inspired by the marvelous view of the rice valley dotted with bamboo huts, which used by local farmers as overnight lodge in harvesting days. Passing the rice terraces and a pretty river you will walk on a quiet road for a while before arriving at Nam Cang village. Your lunch is served at Nam Cang Riverside Lodge, with jungle background and connecting with Nam Cang village by its own suspended bridge. Nam Cang village locates at the most remote area of Sapa. The Red Dao women wear some of the most colorful and diverse costumes of all Vietnam’s ethnic groups. Herbal bath, local medicine and embroidery are some of the things that the Red Dao are very skilled at. Accompanied by your guide, you will explore around the village and learn how the local villagers make writing rice paper, jewelry and embroidery. You may also want to take a swim in the river. At 14:50, you will have a transfer to a meeting point where you meet the Topas Mountain Express for a 4 and a half hour transfer back to Hanoi. Approx: Grade: Moderate/ 3-3.5 hours walking.